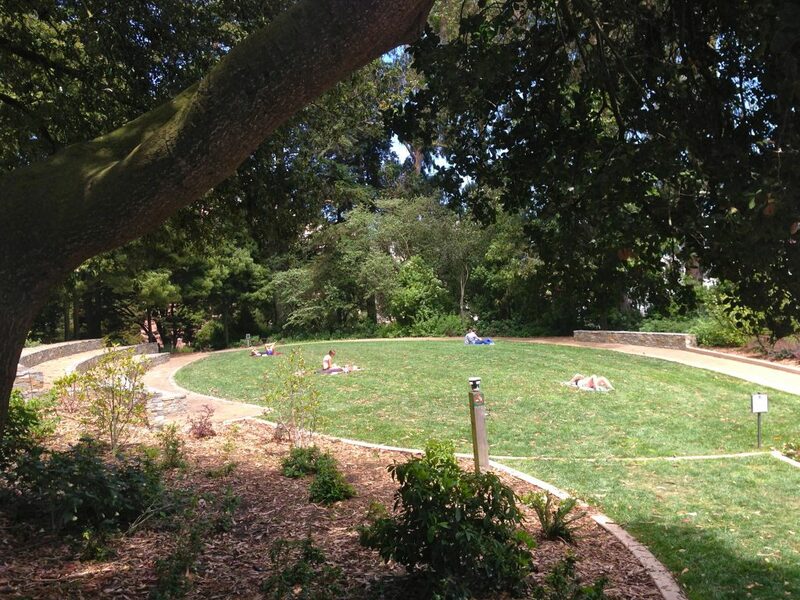 Mime Troupe Meadow in the renovated Lafayette Park honors the historic occasion. Fifty years ago this weekend, police prevented the San Francisco Mime Troupe from performing a play in Lafayette Park, arresting the company’s founder as 1,000 people jeered. The dramatic encounter expanded the frontiers of artistic freedom in San Francisco and indirectly launched the career of legendary rock promoter Bill Graham. The Shell station at California and Steiner. 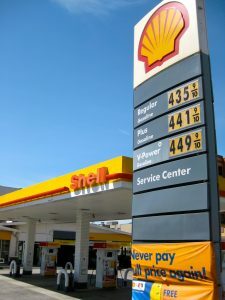 OWNERS OF THE Shell station at 2501 California Street were sent back to the drawing board by the Planning Commission on April 30 and told to return in a month with revised plans — ideally plans that would keep the garage they hoped to eliminate. The owners, a company called AU Energy that owns more than 100 Shell stations, had sought permits to raze the existing station and garage and replace it with a Loop convenience store and twice as many gas pumps. The owners of the station had agreed a week earlier — after neighbors showed up at a Planning Commission hearing to oppose their plans — to scale back the hours the convenience store would operate and to expand only from five to eight fueling stations, rather than the 10 they originally sought. They also extended the lease on the garage, which is owned by an independent operator, through June 30. 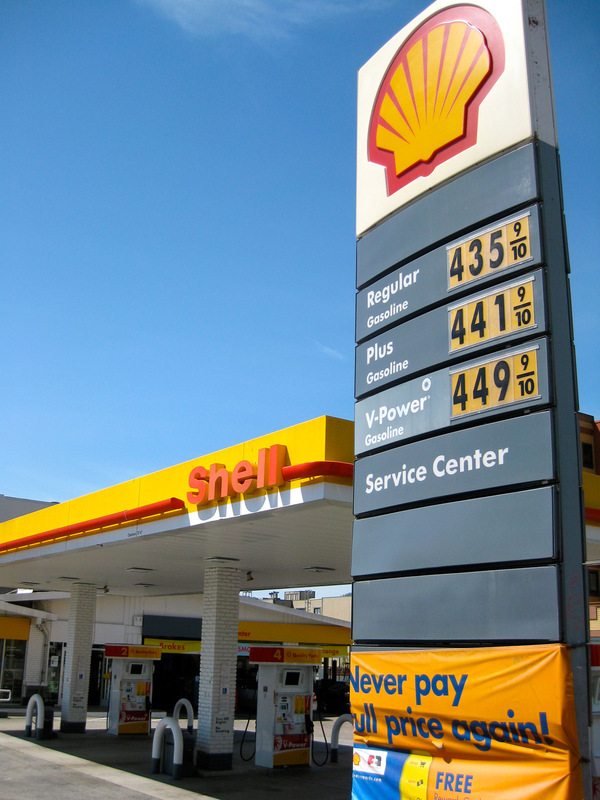 The commissioners were clearly sympathetic to the Shell station owner’s desire to renovate the station in a way that would keep it economically viable as environmental upgrades are made. “We need gas stations,” said Richards, who noted they are disappearing all over the city. 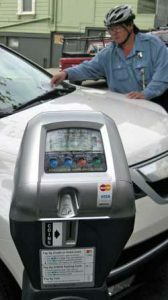 But the commissioners also had heard neighborhood opposition to shuttering the garage and concerns about intensified traffic on an already-busy corner. There were doubts about the appropriateness of the expanded convenience store. The commission voted unanimously to continue the issue until its meeting on May 28. “We’re directing you to try to incorporate service,” said Richards. “That would be necessary and desirable and hugely compatible” with the location and the needs and desires of the neighbors. 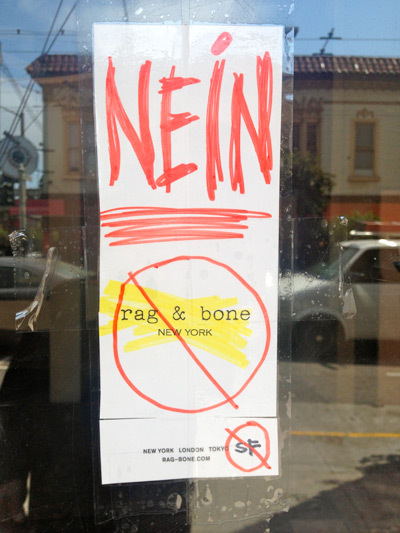 Graffiti at Fillmore and California, where fashion may replace a laundromat. 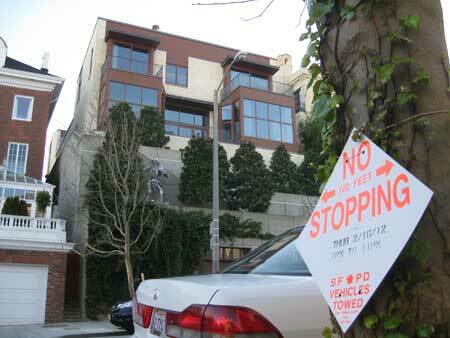 AS FILLMORE STREET continues to rapidly remake itself into a mecca for fashion labels from around the world, supplanting basic neighborhood services, legislation has been introduced at City Hall that would subject more businesses to the city’s limits on chain stores. 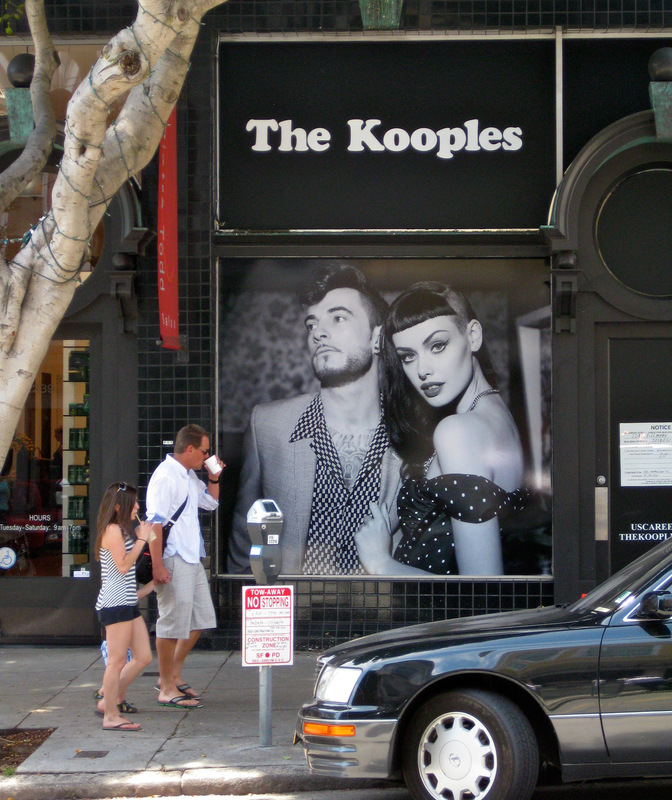 Under the existing “formula retail” ordinance — enacted by the voters in 2008 to limit the proliferation of chain stores in the city’s neighborhoods — businesses must obtain a conditional use permit to open on upper Fillmore if they have 11 or more stores in the U.S.
New legislation introduced by District 2 Supervisor Mark Farrell would amend the ordinance to include stores located not only in the U.S., but anywhere in the world. That would affect companies that have numerous stores in other countries, but are just beginning to establish a presence in the U.S. The legislation would also extend the law to include new businesses started by formula retail companies, whether or not they currently have 11 or more stores. This has been an approach favored by companies such as the Gap, which opened Athleta on Fillmore, and Starbucks, which opened Evolution Fresh. Farrell’s proposal would apply only to the Upper Fillmore Neighborhood Commercial District, which extends from Bush to Jackson streets. Similar efforts have been launched in other neighborhoods, including nearby Hayes Street. In response, the Planning Department has resisted neighborhood-specific legislation and instead proposed that the proposals be delayed while a study is conducted to develop uniform rules. Farrell’s legislative assistant Catherine Stefani said her office would press forward with the legislation despite the Planning Department’s move for a citywide law. “We have told Planning that we plan to proceed with the legislation despite the study because we felt that it was urgent to do so,” Stefani said. President Obama heads to his helicopter this morning at Crissy Field. PRESIDENT OBAMA returned to the neighborhood yet again last night for dinner with deep-pocketed supporters at the Getty Mansion. He was greeted in San Francisco style by a raucous crowd of protesters opposing the Keystone pipeline, then introduced by the Gettys’ down-the-block neighbor, House minority leader Nancy Pelosi. Here’s the pool report on the event. 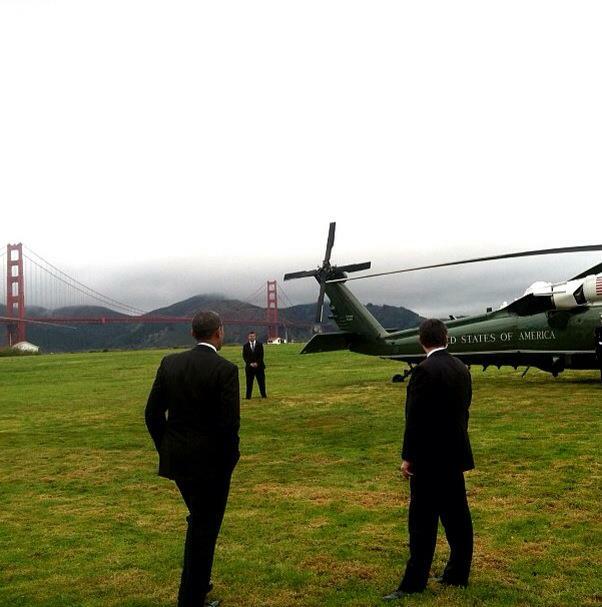 This morning Obama boarded Marine One down the hill at Crissy Field and headed to Silicon Valley. BUDAPEST, Hungary — Many of my Saturdays used to start out with a saunter down Fillmore Street for an early morning cup of coffee while the rest of my family was still in bed. Budapest is also a coffeehouse city, but more famed for the conversations and art that grew out of that culture than the coffee in the cups. It has been three years since we left San Francisco and moved to a country that only a generation ago was behind the Iron Curtain. As I look outside my office here, I see the Statue of Liberty — not the one in New York harbor, but the one atop Gellert Hill in Budapest, erected by the Soviets after World War II. From her office window, my wife looks toward a Soviet monument in the middle of Szabadsag ter — Freedom Square — a golden star topping the prominent stone memorial. From our apartment in Pacific Heights, we looked out on the bay, the sailboats and the container ships crossing under the Golden Gate Bridge. President Obama marveled at the view during the couple of times he visited our home before assuming office. 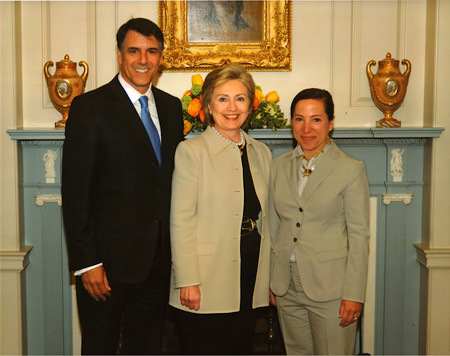 He later appointed my wife Eleni Tsakopoulos-Kounalakis as the U.S. Ambassador to the Republic of Hungary — a complex and demanding job that brought our family to beautiful Budapest. The Kounalakises in their Steiner Street aerie. 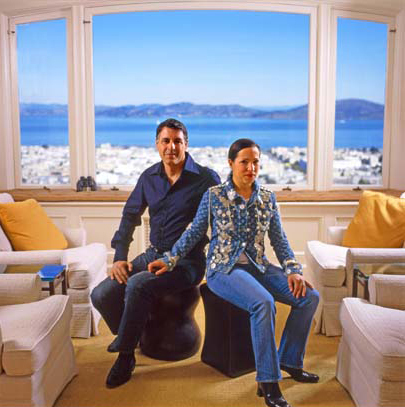 When they’re in San Francisco, Markos and Eleni Tsakopoulos Kounalakis can often be spotted on Fillmore Street, near their home on the ninth floor of the 2500 Steiner Street tower. But these days they’re mostly in Budapest, where she’s the U.S. ambassador to Hungary. Among their visitors from the neighborhood: 2500 Steiner’s 12th floor resident, the staunch Democrat Susie Tompkins Buell, who arrived just in time for the unveiling outside the embassy of a larger-than-life statue of former President Ronald Reagan. “We kept our eye on Susie,” the ambassador told the Chron’s Leah Garchik. Battling what appears to be an upsurge in prostitution, officers at Northern Station have stepped up enforcement efforts in recent months, making a growing number of arrests on Van Ness Avenue. In April, 88 people were arrested or cited on charges related to prostitution in the district — up from the usual monthly tally of 10 to 20, according to Captain Ann Mannix of Northern Station on Fillmore Street. Charges included prostitution, soliciting prostitution and related offenses such as warrant arrests and traffic violations.